Back when I read The Cuckoo's Calling, you may recall that I enjoyed it but felt like it was almost too cozy for me. I have to admit I thought about this when I picked up The Silkworm...a book I may not have read as quickly as I did if not for reading it to discuss with friends. I ended up really liking The Silkworm a lot more than the first one which I think is both because the characters are already established and also because the murder was more interesting! 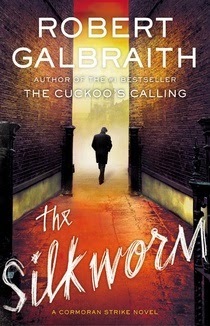 If you don't know, this is the second book in J.K. Rowling's detective series written under the pen name of Robert Galbraith. The main character is Cormoran Strike an army vet with his own fair share of baggage. His assistant, Robin, also gets some time in the book but it's far less. Mysteries are always hard to write about but I will say that I felt like this mystery was surprising but that all the clues had been laid out for me, I just hadn't been paying them much attention! Rowling also seemed to take some fun digging at the publishing industry through all the shattered relationships and poor decisions they'd made! When Cormoran is first called upon to investigate the disappearance of an author, who is supposedly horrible, it made me think of the writer that I learned about through Mark O'Connell's book, Epic Fail, Amanda McKittrick Ros who was apparently a terrible author who thought she was a genius. Everyone knew she was terrible except for her? And Fancourt raging on about how it's a proven fact women can't write reminded me VS Naipaul's comments last year. I think Rowling must find some humor in the many colorful personalities of the literary world! Also, a lot of the women do this and don't do this stuff was kind of important in the end, so if you're reading and it grates a little just be warned! Robin was still a lot of fun, but I wish she'd get rid of Matthew, he's such a loser! But I do understand it's a very long term relationship she'll probably be reluctant to lose! I did feel a little bit frustrated with Strike's ease of using people without wanting to commit to anything, like taking his brother out for a meal, knowing his brother would like more a relationship, but being unwilling to give it. I get that this is the character, but man if the world isn't full of people like that! Anyway! I thought it was fun, funny, and surprising and I enjoyed it a lot! I bought my own copy! Oh and I just googled and found out this series has seven books planned...do you think Cormoran and Robin will get married? ?